How about a dip? Slide down the 25ft slip and slide and splash down into the refreshing pool and repeat. The best value in wet units and soo much fun. 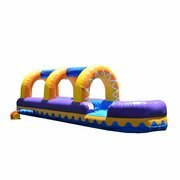 Rent this waterslide for your next Quad City event.